WE MAKE AN IMPACT ON THE COMMUNITES WE OPEN GARDENS IN! Was not long after Garden of Innocence opened in San Diego that we realized that the Gardens are not just about burying a baby. Its about healing! Many people have come to us over the years that have told us about things that have happened in their lives and coming to the Garden and giving their attention to these children who had no one to care for them has brought them to a place where they can let those events of the past go and turn their attention back to the living and the children that need them here in Garden of Innocence. We have had so many people tell us what the Garden means to them and how much it has helped them, so we are including a few stories here. Garden of Innocence is a place of love and healing! Please see Keegans Story on our Home Page on tabs to left. On January 10th 2000, a worker at the Waste-Water Treatment facility in San Diego, found a tiny body floating among solid waste. At first he thought it was a doll but on closer inspection realized it was a child. People don't realize that a waste-water employee has to be on site to rake and watch the conveyor belt at all times. Norm, the worker on site saw the baby fall and called authorities. After the investigation was complete, the Coroner called Garden of Innocence to care for the child. Elissa's first call once we had the child was to Norm, to make sure he was aware that we were going to take of the child and lay him to rest with dignity in Garden of Innocence. We asked him if he would like to name the baby and he chose the name Michael. Norm said that knowing that the baby had a wonderful place to rest and was clean and wrapped in new blankets has given him such closure & helped him to move past this experience and be thankful the Michael was in good hands. When Elissa talked to Norm, he told her that his regular job was as a Missionary and he was doing this job to make money for his family and for travel as a missionary. He was so glad that he was called by Garden of Innocence and to know that Michael was in loving hands. It gave him such peace! A few years later, a women named Esther, called Elissa and asked her if she knew what would be left of her child that was buried in the 40's in New Jersey. She had given birth to twins and one had passed away. While she was still in the hospital her husband and mother in law put the child in a box and buried it. Now in her late 70's she wanted to know if she found that childs burial spot and dug him up could she bring him to California to be laid to rest with her? Elissa told her that most likely there would be nothing left accept pieces of a blanket as it has been 60 years & babies bodies are very soft. She told the Esther, "Why don't you come to one of our services this next Saturday and maybe being there will help you with your loss. That Saturday, the Esther came and Elissa included her in the service, by telling everyone that there was a young lady here that needs closure in an area of her life that has haunted her and we hope that the babies will bring her peace. The lady was also included in the dove release and was able to release a dove in memory of a child in the Garden. After the service, she told Elissa that while she was standing there in the chain of love, she noticed that there was a headstone with the name Michael on it. Her child was going to be named Michael. She said that she now realizes that her Michael isn't in that spot in New Jersey, but is playing in Heaven with all these children and she doesn't have to worry about him anymore. Esther placed a blue Rosary on Michaels grave and it has been in the Garden ever since. You can see the rosary hanging on a tree as the grounds crew put it there so the lawnmower wouldn't harm it. The babies gave both Norm and Esther closure and peace. Janet Keall was abandoned as a new born in Yukon Territory, Canada. She was left on a very cold October morning on the back steps of a hospital in Cougar Country. Thankfully she not only survived the elements & Cougars, but was found and brought into the hospital. She was given the name Baby Girl DOE! Hospital staff kept asking, has anyone fed the baby, has anyone changed the baby and finally the hospital administrator decided to give the baby a name instead of The Baby and she was called Bonnie. Bonnie, now called Janet, has always wondered "Who AM I"! Where do I come from. Am I Alaskian or Canadian? Why did my mother leave me in such a dangerous place. Does anyone know anything about me? Janet has gone to her abandonment site and spoken with the Mounties and seen her file, but no one had any idea about her. She is still left to wonder! Upon hearing about Garden of Innocence, she said she can personally relate to the children resting there and was so grateful that they had this wonderful resting place and that she might have had the same fate as these children. Janet would like to see a Garden of Innocence in every state and province as it has given her closure to know that there are places like this and that she can go visit the children that were not saved and come to a service to support them and all the children that have gone before them. Janet lives with her family in Charlottetown, St. Edwards Island, Canada and is a loving member and Ambassador for Garden of Innocence. We received hundreds of Urns from Woodworkers all across America after April Wilkersons DIY video on "How to make an urn for Garden of Innocence" went on the internet and she challenged her followers to build an urn for us. We have received over 200 urns, many with letters of how this project resonated with them and caused them to pause & be grateful that this one wooden box they made will mean so much to a small child. Enclosed you will find our second shipment of urns. The 8 sided one is made from White Oak harvested here in Northern Alabama. The one with the carved daisy is Hickory harvested in Tennessee. Your note you send after the last box of urns asked us if we would like to choose a name for one of the children. We decided on Daisy, and I carved the flower on the Hickory urn especially for her. If possible, please use that urn for Daisy. It means a lot to me. Thank you very much for the honor of naming a child, and for the chance to do this. It is a balm on a very old wound. My wife and I grew up in a small farming town in Ohio. The local OB/GYN had very strong feelings about people "marrying to young." We were 17 & 19 years old at the time, and fit his definition of "too young" exactly. He was pretty much the only guy in town, so when Laurie got pregnant, we were pretty much stuck with him. He suggested that since we were "too young" we should allow him to abort the child. We refused! At about 6 months, Laurie miscarried and almost died in the process. It was a truly horrible few days. Once Laurie was stabilized, we asked the doctor about the remains for a funeral service. He looked at us like we had said something ridiculous, and said "the tissue has already been disposed of"
We were a couple of emotionally devastated teenagers with no idea of how to respond to that. In the end, we just went home, packed up the baby things, and tried to move on. It has haunted me for the last 25 years that a child of ours was disposed of a medical waste. I am so pleased to have the chance to keep that from happening to other children. Please take care of our Daisy! 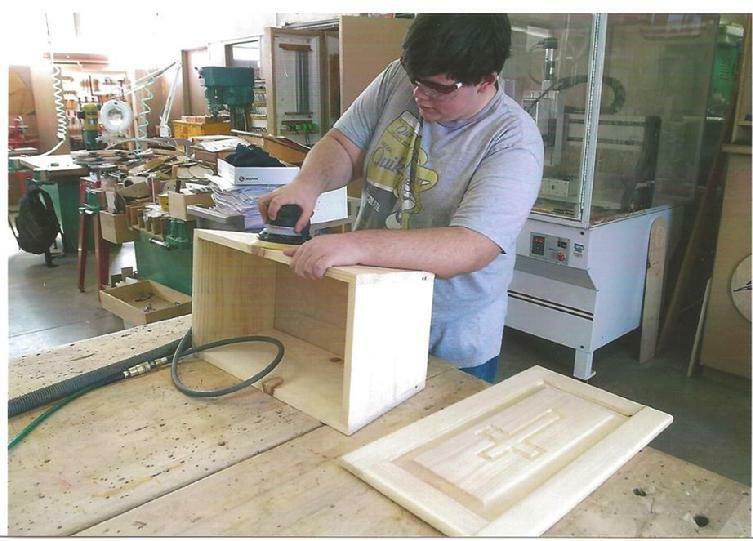 We have a program we started in the high school wood shops called "Children Making Caskets for Children". A woodworking teacher in San Marcos High School in San Diego County wanted his students to do something meaningful and called us about having his students build caskets for Garden of Innocence. One of the boys that build a casket was Aric McDonald who at first didn't care to much for the project but did his best to make the perfect box. He said it taught him how to make a box with miter corners, then make a lid, which they all got to choose an engraving for. But Aric, said that it wasn't until he put the handles on that it became a completely different box. Suddenly he felt grown up, that his box was going to be for a child that parents abandoned him. Aric, felt so lucky that he had wonderful parents that loved him and felt proud that his box was a special place for a child, he didn't even know. He felt like he was doing something special for someone else and wanted now, to find other ways to help other people and volunteer for other projects. Garden of Innocence taught him to give back and not take things for granted. He loved his project and was very proud of what he accomplished. Stephen Packard was our first Boy Scout that wanted to build caskets for Garden of Innocence as his Eagle Scout Project. He wanted to do this project in memory of his little sister Emily that had passed away as a baby. He wanted to do something that was impactful and would be a sign of respect for his sister. Stephen made us 20 caskets, put together a team of about 18 boys and 20 plus women and girls to build and line the caskets. In memory of Emily, he wanted them all to be beautiful and respectiful. He told us that when the project was complete and he could look back at all he had accomplished with the help of his family and friends, he felt proud that he was given the chance to feel closer to Emily as he knew she was guiding his heart and hands and loved her even more for having her in his life for even a short time. He was given peace knowing that through Emily, he was able to help other children on their way to Heaven. 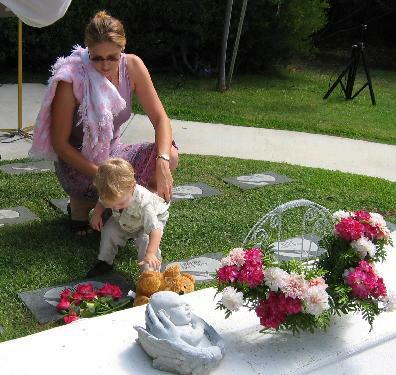 Nance Welles, grandson Lucas was hit by a car and killed while riding his skateboard on January 29th 2010. She has never found closure with his death. Thankfully, Elissa asked Nance if she would like to name a baby after her grandson and she gratefully accepted. Because of a rift in the family Lucas cremains have never been laid to rest and there was no place for Nance to go to be with him. With a baby named Lucas in Garden of Innocence & a headstone with his name on it, Nance has a place to go to honor her grandson. She called him Turtle, and placed a turtle there as a gift for him. Sadly, things disappear from the Garden but everytime we find a turtle we take it to Lucas and place it on his headstone for Nance. For Nance, she has some closure, though her tears always fall for HER Lucas, but she was able to give a child a name that meant something special to her and pay it forward in memory of Lucas. Enrique Reade is the General Manager of Garden of Innocence National. Elissa met him in April of 2012 when she was presenting the story of Garden of Innocence to the Board of Supervisors of Fresno County, in hopes that they would allow her to assist with the indigent burials of abandoned children in Fresno County. At that time, Enrique was the owner of Reade & Sons Funeral Home in Fresno and he told her that she had a "good product!" He said "that may sound strange to hear it described that way, but what you have done is special, unexplanable & very dignified. I have never heard of anyone doing such a thing and I want to be part of this amazing story." Enrique never stops paying it forward. He is always out in his community helping someone in one way or another. With food, clothing, furniture, whatever it takes. He lost his son, Josiah when he was just three years old, when he was run over by a neighbor. He immediately told the neighbor that it wasn't his fault. It was an accident! Years later he started the "Scared Stiff" program for teenagers who have had a DUI or may go that route as he has had to bury so many young people because of drinking and driving. "Scared Stiff" took the teenagers into the morgue to see up front and personal what happens when you drink and drive. He wanted to save their lives, to scare them straight. The program is still going strong in Fresno. Growing up in Central LA in the shadow of Watts, he has seen his fair share of life on the streets & deaths as he has been in the funeral business for over 30 years. He told me once that preparing a body for their funeral is only an illusion. He is a gentle man when it comes to putting them back together, as he say, "their Mother might be there!" What he sees happening in the Garden has lifted his soul and given him a new path to take. Becoming part of the staff of Garden of Innocence National has enriched his life and he too can help make sure that no child leaves this earth without someone who cared. As Enrique says, "It's the right thing to do!" Our wonderful Knight, Michael Burr!
" If No One Grieves, No One Will Remember!"